This is the 2019 race info, including opening times, locations and other particulars. BSI reserves the right to change the route, program, and date of the event. * Based on the previous day’s results the participants start in pairs every 2-3 seconds. The start list will be placed near the start stage and the speaker will call the participants. Runners, who finish within 15 minutes of the time limit the previous day, will start 30 minutes before the field the next day. Organizers will be in contact with details at the finish line. You can run around Lake Balaton in 4 days as an individual. The expected distance is 196 km in sections between 48 km and 53 km. Each day the course is divided into three legs. Teams of two, three, or four people can divide the legs freely however exchange is only permitted in the designated zones. For the length of each leg refer to the course description. Individual entrants may also run the first relay leg as a member of a relay team. Run around the half of the lake. Compete on Saturday and Sunday and run 94.9 km in two sections. For the length of each leg refer to the course description of the 3rd and 4th day. The distance of the 12th Lake Balaton Supermarathon will be 196,250 m and the 12th Half Lake Balaton Supermarathon will be 94,900 m.
ATTENTION: These are planned distances for each section. Small deviations are possible due to weather conditions. The length of the stages is subject to change due to road construction works and other issues. The race center will open on March 20th (Wednesday) late afternoon in the Hotel Magistern, Siófok. Each race day the race centre will be open next to the start and finish areas for several hours to handle any requests, issues, questions. In the race center (Siófok, Hotel Magister) on March 20st late afternoon or March 21st morning. Individual entrants running the 4-day race will be given one bib, which must be worn on your chest and must be clearly visible. Relay team members will each be given one bib, which must be worn on your chest and must be clearly visible. Facilities will be provided each day at start and finish areas in nearby buildings or tents. At the relay exchange stations changing rooms are set up in tents every day. Individual entrants will be able to drop-off their baggage at the start area and these will be transported to the finish area. There are no cloakrooms at the relay exchange stations. Team members must transport all belongings for themselves. Portable toilets will be positioned at the start and finish area, at the refreshment stations and relay exchange stations. Refreshment stations will be set up at the start and finish areas, and at the relay exchange zones. Additionally, each leg includes one or two stations, depending on length. As a result, there will be 8 to 12 refreshment stations each day. Check out the race map to see the exact locations. Refreshments for individual runners include water, sports drinks, glucose tablets, dried fruit, beer, coke, fruit, chips, chocolate, cereal bar, salt, bread, magnesium, calcium, tissues, toilet paper, and plasters. Individual runners can have their own refreshments sent to any station. Relay members can refresh with water, sport drinks, glucose tablets, magnesium, calcium, tissues, toilet paper, and plasters. 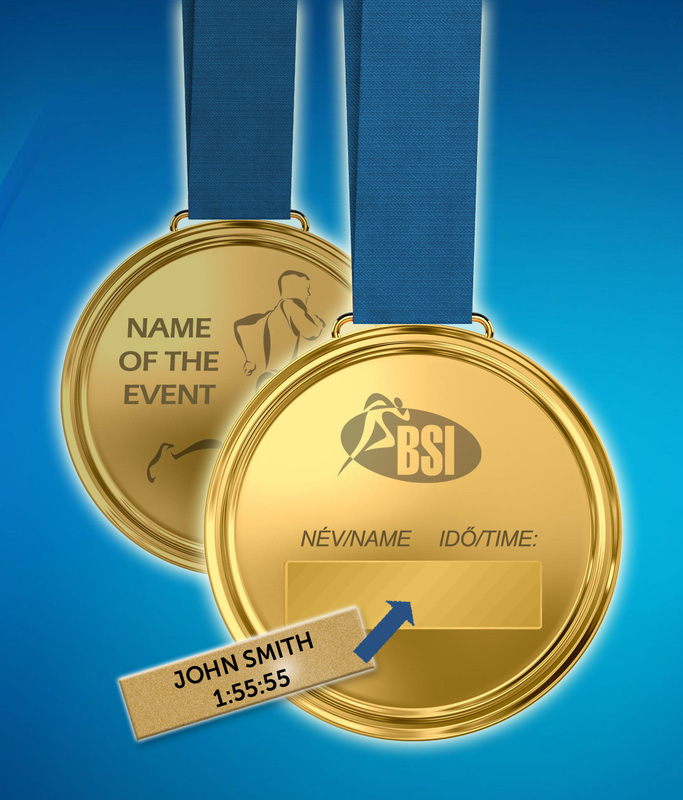 Order your medal insert engraved with your name and your result! By doing this you can skip the long queues and you don’t have to bother with cash. Buy it online and after the event, we will send you the medal insert engraved with your name and time that fits neatly into the back of your finisher medal. We will engrave your name and time on a small stick-on metal card. We will send it to your postal address and when you get it you can easily stick it onto the back of your medal and your unique medal is ready! The medal insert can be ordered prior the race online at the entry.budapestmarathon.com website. The personal medal insert can only be ordered for individual runners, not teams. The price of the medal insert with shipping and handling (to a foreign address) is 6 €. If an entrant does not reach the finish line within the time limit of that day, they can start the race the next day, but their names will appear in the list of results without any ranking, only their total time and the distance they have covered will be shown. By race day, individual entrants must be 18 or older (born before 21 March, 2001). By race day, relay team members must be 12 or older (born before 21 March, 2007). All the events will be chip timed. Daily results are hanged in the lobby of the official race accommodations as well as in the start area next day. Additionally, the full list of results will be published online here. Individual runners will have the chance to take advantage of an approximately 15 minutes massage daily after finishing. Free massages are available for runners who present their start numbers. Relay members may massage for a small fee. Priority is given to individual runners. The course is marked on the cycle path around Lake Balaton and – especially on the southern shore – on (usually bicycle-friendly) roads with little traffic. When it is necessary because of the course, (at railway level crossings and when you have to cross Road 71) there will be race marshals or policemen to direct traffic. Otherwise, entrants should try to run responsibly and they have to comply with the rules of the Highway Code and pay attention to others. If you need further information about Hungarian traffic laws please talk to our staff in the race center. Any team member can run any of the sections but they can only hand off the relay race number to the next runner in the relay exchange areas. There will be changing rooms and refreshment at relay exchange stations for team members. There will be refreshment stations on the course between relay exchange stations, usually 2 stations, or 1 in case of shorter sections, but team members can also hand over individual refreshments to the running member of the team at refreshment stations. We can only accept the registration of those 2-person relay teams and 3-4 person relay teams who can take the team members to relay exchange points themselves! Runners are recommended to take their mobile phones with them on the course. Due to the nature of the course and higher risk of incidents hand-bikers are not allowed to participate in the race. As the course is marked on a cycle path or bicycle-friendly roads where THERE IS some traffic, it is not recommended to wear earphones plugged into both ears for your own safety. Participants are only permitted to run with someone on a bike or on roller-skates from the 1st hydration station each day. Anyone who tries to do it earlier can get a 10-minute time penalty. Any commercial or promotional activity should be permitted by BSI in advance, in a manner determined by BSI. BSI reserves the right to limit the number of participants and close registration at any time. BSI reserves the right to change the route and the date of the event.